Supporting up to 24 ports of VDSL2 connectivity and 2 Gigabit Copper ports for uplinks offers higher port density to deliver next generation services in a variety of hospitality environments. Software features including QoS and IGMP which are designed to provide better support for Video On Demand and other enhanced services for Hospitality Environments. Supporting up to a maximum of 100M Upstream and 100M Downstream bandwidth. The bandwidth does change with increased distance but still provides a high throughput for internet and advanced applications. 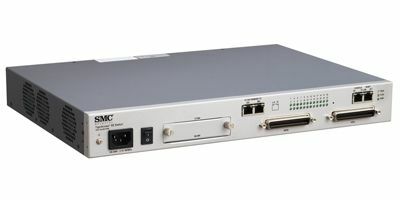 As part of SMCs commitment to standards based networking solutions the SMC7824M/VSW supports industry standard features. This includes Spanning Tree, VLANs and 802.1x delivering reliable, fl exible and secure solutions for hospitality environments. SMC's VDSL2 Extended Ethernet network solution provides an alternative cost-effective solution for network/Internet access to multi-unit buildings or enterprise environments such as hospitals, universities, and manufacturing facilities. Using existing category 1, 2, or 3 wiring, SMC's Extended Ethernet technology is able to deliver up to 100Mbps of broadband connection for distances up to 800ft. SMC's Extended Ethernet solution minimizes the hassle involved in rewiring by delivering both voice and data access on the same line as Plain Old Telephone Service (POTs). SMC's EE solution is the best choice for service providers to supply broadband access with minimal changes to existing wiring infrastructure. VDSL2 enables the provider to offer a larger range services over the existing telephone wires which have been unavailable due to the high bandwidth requirements such as HDTV streaming and Video On Demand.